The painter and writer Mira Schor and the sculptor and multimedia artist Janine Antoni will participate in the Annual Artists’ Interviews, taking place in ARTspace during the 2013 Annual Conference in New York. This session will be the thirteenth installment of the popular series, which features two major practicing artists in back-to-back interviews. The talks will be held on Friday, February 15, 2013, from 2:30 to 5:00 PM at the Hilton in New York. Stuart Horodner, artistic director of the Atlanta Contemporary Art Center in Georgia, will interview Schor. Klaus Ottmann, director of the Center for the Study of Modern Art and curator at large at the Phillips Collection in Washington, DC, will interview Antoni. Mira Schor is a painter, writer, and educator who was born in 1950 into a family of artists in Manhattan. Entering her fifth decade as an artist, she has used the medium of painting to address a wide range of issues: language, corporal materiality, feminist politics, art history, and critical theory. 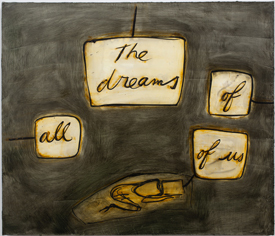 She has also worked in artist’s books and sculpture and has a longstanding engagement with works on paper. As an art writer and editor, Schor works in the belletristic tradition of John Berger and Virginia Woolf, with her essays combining the candor of a village storyteller with the rigor of a critical approach and maverick fearlessness. Her latest book is A Decade of Negative Thinking: Essays on Art, Politics, and Daily Life (2009), and she writes regularly about the intersection of art and life for her blog A Year of Positive Thinking. Schor is based in New York and Provincetown, Massachusetts. Read CAA’s full profile of the artist, which includes more images of her work. 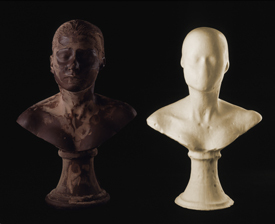 Janine Antoni’s work is an amalgam of shamanistic ritual, quotidian task, and daredevil action. Her performances include using her dye-soaked hair to mop a gallery floor; sleeping in a bed set up in a gallery and then weaving a blanket based on the pattern of her rapid eye movements; and walking across a tightrope of hand-plied hemp that she made herself, suspended eight feet above the ground. The arduous process of the performance is often combined into installations with sculpture, photography, and video. It is Antoni’s desire that her artwork be understood as a felt experience, one that combines emotional content and intellectual engagement. In each piece, no matter the medium or image, a conveyed physicality speaks directly to the viewer’s body. Antoni lives and works in New York. She participated in the 2011 Annual Conference, speaking on the popular Centennial session “Parallel Practices: When the Mind Isn’t Focused on Art.” Read CAA’s full profile of the artist, with several photographs of her work.